Workshops begin on Saturday 26th, September 2015. Check out “Workshops” on the Home Page for a detailed list of what’s coming up for the rest of 2015. Do you love all things oriental? 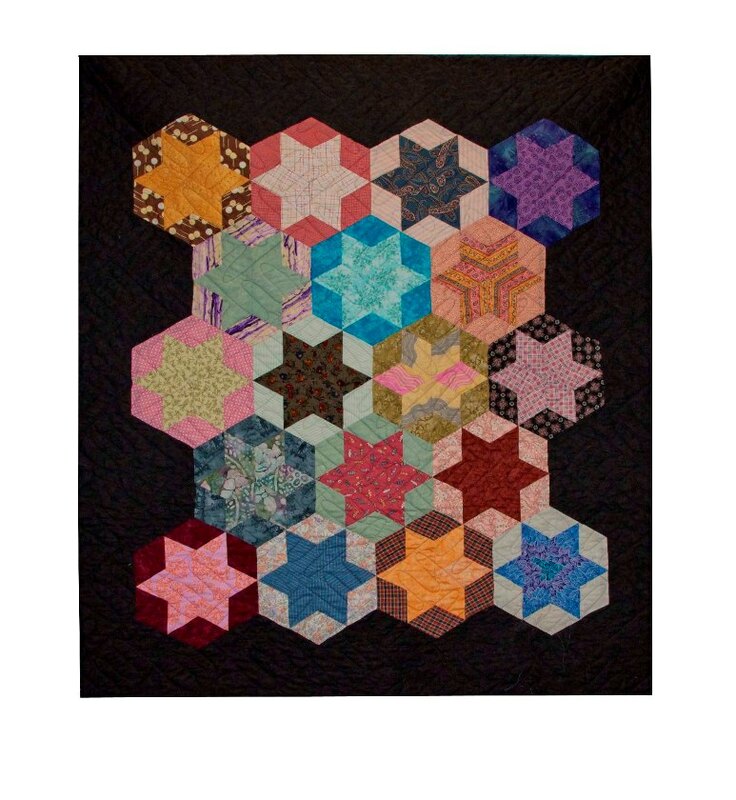 If you answered yes, then you will be pleased that an all time favourite block has made it to the “Quilt Kit” range at The Quilt Fairy. 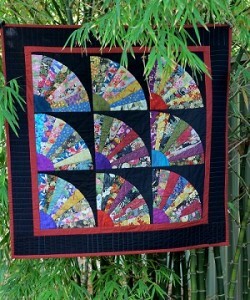 Our popular “Oriental Fans” have been combined together to create a complete Quilt Kit. 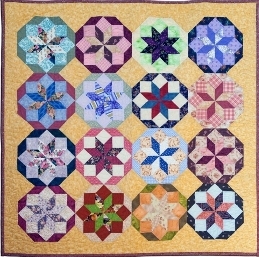 This quilt can be completed by hand or machine. In your kit, you will receive 9 individual fan kits, 9 black background squares to applique your completed fan onto, along with the borders and binding fabric to complete your quilt top. If you would like to have a complete quilt including the wadding and the backing, we can arrange that for you as well. Contact Michelle on 0412-306-292 or email: thequiltfairy@iinet.net.au to reserve your Kit now. Michelle Jones, the” new” Quilt Fairy, welcomes you to this site. 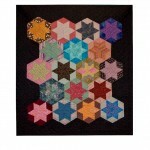 New and exciting hand and machine piecing projects will be emerging in the next few months. Judy would like to say a big “Thank You” to all the lovely people she has met along the way and will be supporting Michelle in her new adventure, as much as time permits. We look forward to the new ideas, that are spinning around in Michelle’s head, becoming a reality. We have an extensive range of pre-cut and colour sorted fabric hexagons. You can now choose from individual Colour Sorted Packs, choose from Purple, Pink, Blue, Green, Yellow, Cream, Red, Black, Ecru, Orange and Brown Packs along with Charm Packs, Hexagon Flowers,Grandmothers Flower Garden and Background Fabrics. Purchase these packs to make an entire scrap quilt, use the pre-sorted colour packs to make an individual colour quilt or add variety to your collection. 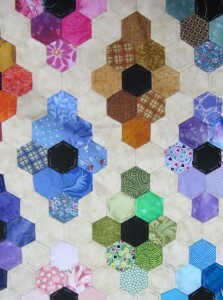 We also have packs of neutral pre-cut hexagons for the pathway and solids for your centres. Charm Packs available in larger sizes for 2″ & 3″ Piecing papers. 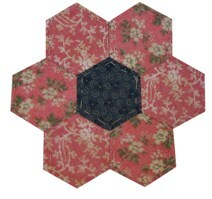 Grandmothers Flower Garden and Hexagon Flowers are available in the smaller sizes. Piecing Papers are extra but are supplied at half price if needed. “Getting Started” , our Saturday afternoon sewing group, has grown and is now called “Quilters Circle”. 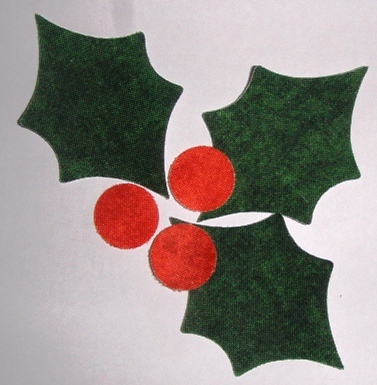 As always, we welcome beginners as well as experienced quilters to our group. Due to booking complications, we are moving down the lane to Minchin House, (behind Swanleigh..opposite church grounds) end of Yule Ave, Middle Swan. To make it easier this year, we will be keeping to a strict fortnightly timetable, commencing on Sat, February 4th at 1.30pm. At timetable listing of meeting dates is found in ‘Services’ section of this website. We’re looking forward to seeing our regular friends and hopefully many newcomers. If you think you would like to be part of our relaxed, friendly group, register your interest with The Quilt Fairy 0412306292 email thequiltfairy@iinet.net.au.